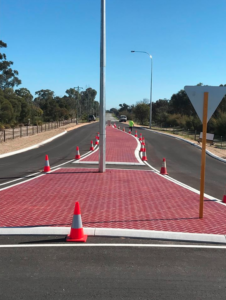 The City of Cockburn is a progressive and community focused government organisation, aiming to create a sustainable community that is cared for, connected and ready for the future, which is why the team at Wespray on Paving was approached by the City to assist in the completion of various intersection upgrades in the Township of Banjup. 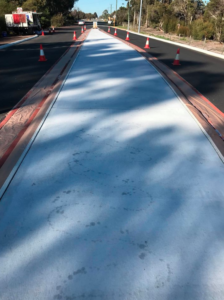 We were honoured and thrilled to be a part of this job, ensuring the completion of the various intersections to the highest quality that our customers have come to expect from us. 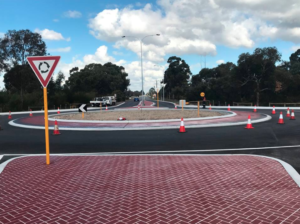 Over 800sqm of 45degree Herringbone in the Sentosa red with a charcoal edge strip to the roundabout. To achieve the aesthetically pleasing finish that’s pictured here, we used a 45-degree Herringbone paved look in Sentosa Red. For more information on our professional commercial resurfacing finishes, contact Wespray On Paving today!